Roary The Racing Car Party Ideas and Roary birthday cake ideas to help you host a roaring great party at Silver Hatch race track with Roary and the whole gang! 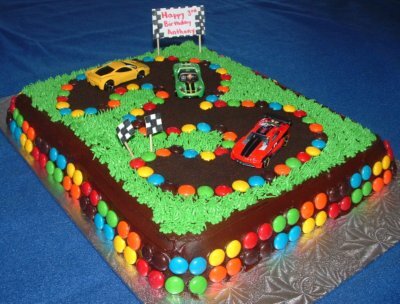 The racing circuit is filled with excitement as your birthday party adventure begins. Use sidewalk chalk creating a race track leading the guests into your house. Make a finish line to hang in your home as a decoration. Create a sign calling the kitchen your pit stop. Hang balloons and streamers that are red, white and black. Use a green table cloth (looks like grass for the cake). Hang Roary the Racing Car Posters that can then later be hung in your child’s bedroom after the party. Roary Slips Up! - have a version of a water balloon toss. Pair up the guests and give them each a water balloon. They need to toss the balloon back and forth. If the balloon breaks then the pair is out. Big Chris Flags it Up - Make finish line flags. Use larger thick paper, markers, tape and a dowel (stick). Have the guests decorate their flags. If you wish they could also use stickers and glitter glue to create their design. Express Delivery - Help Roary deliver the eggs. Each guest needs to balance an egg on a spoon and race it to their destination. Each guest needs to get 3 eggs into the finish basket without breaking their eggs. This may be messy so an alternative would be to use water balloons or hard boiled eggs. Roary Takes Off - Fly a kite and blow bubbles. For the bubbles use a large pie plate and fill it with bubble soap. You can use many things from your kitchen to make the bubbles. Rusty Remembers - Have the guests sit in a circle. 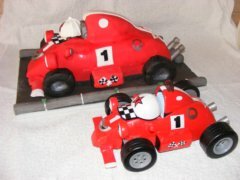 Use either pictures of the characters or the toys from Roary the Racing Car. Place them all out and have the kids cover their eyes. One guest then will remove one of the cars. Then the other guests can guess which car is missing. Communication Breakdown - Divide the guests into two groups in two rooms. Give each group a wakie talkie. Let them talk to each other. Musical Mayhem - depending on the age, play musical chairs or host a dance party. Show off all your great moves. Demolition Derby - get out your tricycles, bikes, scooters and ride them up and down your driveway. Use sidewalk chalk or pylons and create your own Silver Hatch Race track. Silver Hatch Hero’s - Create a podium and take pictures of the kids in first place. Have them hold a gold medal and a trophy. Give them this picture in their thank you card. Roary Goes Missing - have the kids go on a search and rescue looking for Roary. As they are searching put out the Roary birthday cake. When the kids find the cake you can sing Happy Birthday and enjoy the cake. "This cake was made by producing a slab of sponge and then cutting to the shape I wanted. It was modeled on the toy car." Serve food like you would eat at a real race track. Hot dogs, hamburgers, pretzels, and pop. Invite the guests to have a pit stop to refuel when it is time to eat. 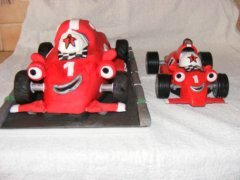 For dessert serve either a Roary the Racing Car cake or a Race track Cake.